There’s More To Tile Murals Plus Than Tile Murals! 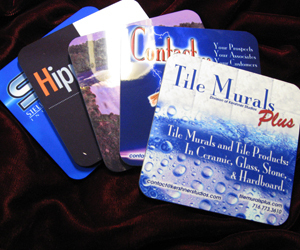 Designed with the smaller business or organization in mind, Tile Murals Plus also offers a line of quality custom products for give-aways, presentations, and sales. These products, customized to your specifications, available in smaller quantities with wholesale pricing. These items provide a great opportunity to offer something totally unique for tradeshows, craft shows, seminars, give-aways, customer gifts, or special occasions! Below you will see a small sampling of our items. Contact Us for pricing and minimum quantities. 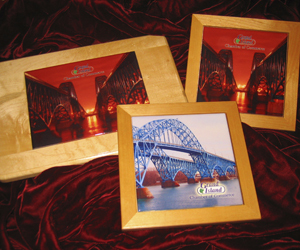 (Shown Above) High Gloss, Hardboard Coasters with Cork Backs. These are are a great sales giveaway… one that is actually used and not stuffed in a drawer! We have created and sold thousands of these! 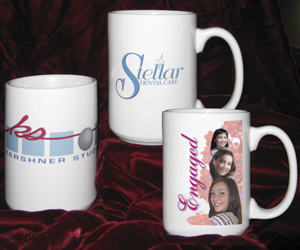 (Shown Above) 15 oz Ceramic Mugs for promotion, showers, awards, give-aways, and incentives. Small quantities makes them affordable. A classic! (Shown Above) Our unique ceramic tile mural (and single tile) clock. 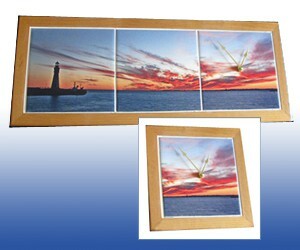 Shown here are clocks produced with an image from a local photographer who sold these at craft shows. (Shown Above) This totally custom walnut and maple box was completely handmade in our shop at Tile Murals Plus. 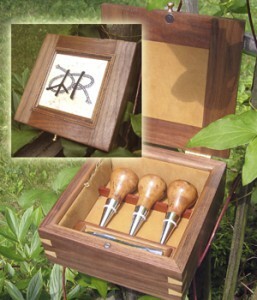 The turnings, created in house, for the wine stoppers are of exotic asian hardwood and the satin finish tile insert shows the logo (and brand) of the recipient. The interior is fully lined in genuine suede. (Shown Above) Custom made in our Tile Murals Plus shop, these items were used as thank-you presentation gifts to invited speakers. The framed tiles are satin finish in solid maple frames while the cutting board is a tempered glass tile inset into a custom-made figured maple surround.